Each player reveals 3 Monster Cards from their Deck simultaneously, one at a time. 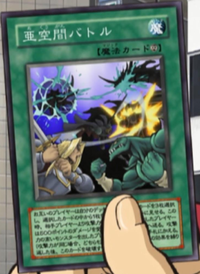 Each time both players reveal a Monster Card this way, the player who reveals a Monster Card with higher ATK adds that card to their hand, while the player who reveals a Monster Card with lower ATK takes 500 damage and sends it to the Graveyard. This page was last edited on 8 July 2017, at 13:19.